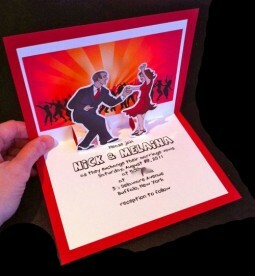 Pop up invitations are a fun way to add a bit of buzz and pop about your 80th birthday party. You can also use this tutorial to make a charming card to send special 80th birthday wishes. Melaina over at Offbeat Bride has a great tutorial, chock-full of pictures, that explains exactly how to make pop-up invites. It’s pretty straight forward (although a bit time-consuming). If you’re the crafty sort, making your own pop up invites might be right up your alley! She obviously made a wedding invitation, but you can change it to whatever theme you’d like to use for your party.